The story and history of Saint Pius V. A Dominican friar from his fifteenth year, Michael Ghislieri, as a simple religious, as inquisitor, as bishop, and as cardinal, was famous for his intrepid defence of the Church's faith and discipline, and for the spotless purity of his own life. His first care as Pope was to reform the Roman court and capital by the strict example of his household and the severe punishment of all offenders. He next endeavored to obtain from the Catholic powers the recognition of the Tridentine decrees, two of which he urgently enforced - the residence of bishops, and the establishment of diocesan seminaries. He revised the Missal and Breviary, and reformed the ecclesiastical music. Nor was he less active in protecting the Church without. We see him at the same time supporting the Catholic King of France against the Huguenot rebels, encouraging Mary Queen of Scots, in the bitterness of her captivity, and excommunicating her rival the usurper Elizabeth, when the best blood of England had flowed upon the scaffold, and the measure of her crimes was full. But it was at Lepanto that the Saint's power was most manifest; there, in October, 1571, by the holy league which he had formed, but still more by his prayers to the great Mother of God, the aged Pontiff crushed the Ottoman forces, and saved Christendom from the Turk. 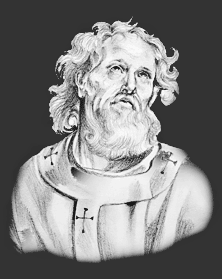 Six months later, St. Pius died, having reigned but six years. St. Pius was accustomed to kiss the feet of his crucifix on leaving or entering his room. One day the feet moved away from his lips. Sorrow filled his heart, and he made acts of contrition, fearing that he must have committed some secret offence, but still he could not kiss the feet. It was afterwards found that they had been poisoned by an enemy. The Feast Day of Saint Pius V is May 5. The origin of Feast Days: most saints have specially designated feast days and are associated with a specific day of the year and these are referred to as the saint's feast day. The feast days first arose from the very early Christian custom of the annual commemoration of martyrs on the dates of their deaths at the same time celebrating their birth into heaven.